Environmental management is another field of research and practice integral to any discourse on knowledge and social learning for environmental policy and decision making. A simple definition of environmental management states that it consists of ''actual decisions and action concerning policy and practice regarding how resources and the environment are appraised protected, allocated, developed, used, rehabilitated, remediated, and restored.'' Much of current environmental management focuses on the integration of social and ecological systems, as our understanding of environmental issues has evolved. In this context, environmental decision making has to address both the complexity of ecological systems and the complexity of interdependent human organizational and institutional systems. Several scholars have set a profound and necessary precedent with their work, explicitly integrating the study of natural resources with human organizations and institutions to focus research and intervention on integrated SESs. In recent decades, efforts to address some of the paradoxes in resource and environmental management have required an evolution in thinking about environmental science and decision making. The result has been a shift from reductionism, command and control science and management, to a more integrated, adaptive, systems-based approach. Integral to this more systemic approach to environmental decision making has been the incorporation of an emerging body of theory often referred to as complex systems theory. Complex systems theory has offered a more sophisticated understanding of the structure and dynamics of both social and ecological systems than the relevant 'traditional' scientific disciplines. Even this integrated, systemic view of SESs does not explicitly acknowledge the complexity of the process of social learning for decision making within SESs. The integration of planning and governance theory with complex and critical systems thinking, as well as with social learning, points to new opportunities in the study of environmental decision making. Attempts to extend insights from the field of social learning to the practice and study of resource and environmental management have also contributed to the discourse on social learning for environmental planning and decision making; for example, how public participation in environmental assessment processes provides opportunities for social learning. Works in the field of environmental management have highlighted the importance of integrating social and ecological systems, highlighting the importance of social learning for the purposes of environmental decision making. Governance is another main field of practice in which the linkage among knowledge, learning, and intervention in the context of environmental decision making is prevalent. Governance focuses directly on the political side of the decision making. There are several definitions of governance; however, all of these speak to a conception of political economy, and more generally decision making and knowledge for intervention, that is more broad-based, flexible, and evolving than traditional models of public decision making through government intervention. Complex systems approaches could provide, and are already providing, governance stakeholders with philosophical and methodological underpinnings and practical heuristics to look critically at the interface of learning and intervention. The governance literature highlights the importance of politics and pluralism in decision making. The literature on social learning attempts to make operational many of the complex epistemological issues around the nature of knowledge and the process of learning. A useful and less theoretical definition underlines that "social learning means more than merely individuals learning in a social situation ... (they) envision a community of people with diverse personal interests, but also common interests, who must come together to reach agreement on collective action to solve a mutual problem.. .it is the process by which changes in the social condition occur - particularly changes in popular awareness and changes in how individuals see their private interests linked with the shared interests of their fellow citizens.'' Social learning is intended to help improve the quality and wisdom of the decisions when faced with complexity, uncertainty, conflict, and paradox, and the notion has begun to be applied in a variety of complex decision-making contexts, including environmental management and planning. Environmental planning and management are often described as complex and highly uncertain and, from this perspective, management cannot be seen as the search for an optimal solution to a single problem but rather as an ongoing process of adaptation, learning, and negotiation. Thus, to manage complex adaptive systems, it is necessary to create a learning atmosphere, encourage systemic thinking about complex problems, discourage competitive behavior among stakeholders, and focus on 'desirable and feasible change' rather than attempting to achieve absolute consensus on management issues. An example is given by the application of social learning to river basin management, considered as the capacity of different authorities, experts, interest groups, and the public to manage their river basins effectively. Often, limitations of existing institutions, to consider multiscale, participatory forms of governance for groups involved in river basin management are present. These applications show that social learning processes can improve stakeholders' awareness and participation in environmental deliberation and decision making and therefore contribute to practical change in environmental management as well as institutional change. Despite the lack of theories linking the creation of ecological knowledge from observations and understanding to its incorporation into resources use, Figure 2 provides a conceptual model of possible responses to a crisis situation. In this context, the term crisis broadly refers to a large perturbation, and it may be human made (resource collapse) or natural (hurricane). 3. response with experience, in which the institution has previous experience with a crisis of that kind and management policy used on previous occasions. Figure 2 Three generic responses to resources and environmental crisis. Most responses fall into categories of (1) no effective response, which can lead to larger-scale surprises; (2) reacting with no memory or experience; or (3) responding through learning. institutional learning. This is the case in which the crisis is a true surprise, so that the institutions will have no previous experience with it, or the crisis may have been predictable but be of magnitude that had never been experienced in that area. 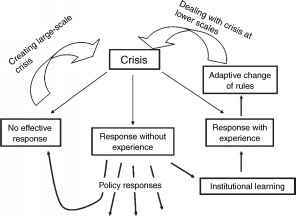 The response with experience is possible if the memory of the experience provides a context for the modification of management policy and rules, so that the institution can act adaptively to deal with the crisis. The more useful management to be applied to SESs is adaptive management, and the more useful assessment is based on the integration of different disciplines. Adaptive management needs to at least maintain political openness, but usually it needs to create it. Consequently, adaptive management must be a social as well as scientific process. It must focus on the development of new institutions and institutional strategies just as much as it must focus upon scientific hypotheses and experimental frameworks. 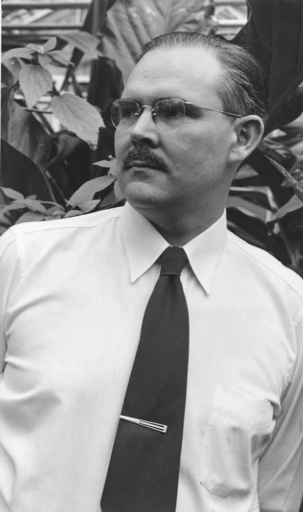 Adaptive management attempts to use a scientific approach, accompanied by collegial hypotheses testing to build understanding, but this process also aims to enhance institutional flexibility and encourage the formation of the new institutions that are required to use this understanding on a day-to-day basis.